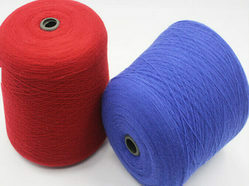 We introduce ourselves as one of the acclaimed manufacturer and exporter of Polyester Wool Yarn. - Blend : 60/40, 70/30, 80/20, 90/10. - Raw White, Dyed & Melange. Known for soft feel, strength and providing warmth, our range of wool yarns is in high demand across the globe. This Woollen Yarn is offered at industry leading prices and is used in garment industry at wide scale for manufacturing Blankets, Blazer Fabric, knitwear and other garment items. We specialize is supply of Dyed Wool Yarns on Cones in all yarn counts either from stock or against order for customized usage. We are a well-renowned organization in the industry to provide our patrons the best quality array of Embroidery Wool Yarn. 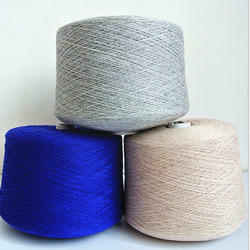 We are the prominent supplier of Australian Wool yarn 100 % (AZO Free ) and woollen Blended yarn. All counts and blend as per buyers requirement in all counts. We are looking buyer of wool spun yarn. Shade: Raw White and Dyed both, Count: Nm 10 to 120 at single and double ply, End-used: Shirting and Suiting. Product development at Kapotex continues to be one of the key cornerstones that maintain its reputation as one of the world's leading carpet yarn solution providers. Our Manufacturing facility is located in Sarigam Industrial Estate, neighboring Vapi in Gujarat, near the city of Mumbai and Port of Nhava Sheva. Our production facilities are contemporary with global standards. We offer a vibrant spectrum of woolen yarn to customers. The woolen yarn that we manufacture and supply is made for some superior quality woolen. The organic wool yarn is manufactured over the high-tech machines, which proved them extreme durability. Along with called among the topmost suppliers of India, we are coined as the best wool yarn manufacturer.